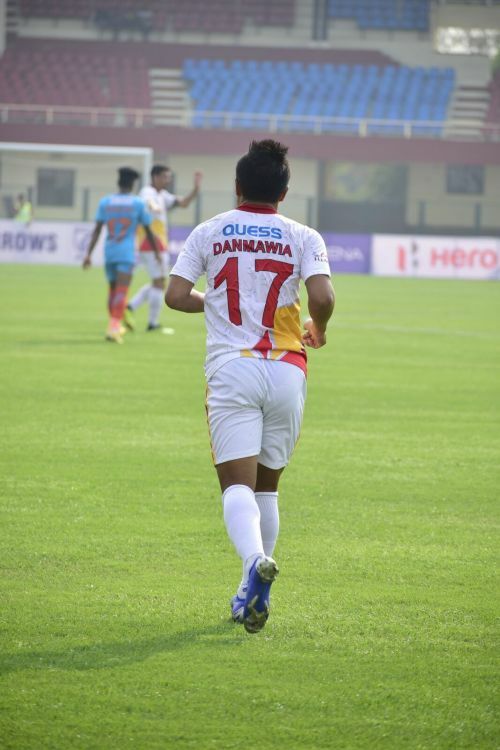 After a draw against Real Kashmir at home in their previous match, East Bengal again got back to winning ways. They defeated Indian Arrows by 2-1 in their away match at the Kalinga Stadium in Bhubaneswar. The win helped the red and gold to climb up to the fourth position on the league table with 19 points from 10 matches, overtaking Churchill Brothers thanks to a better head-to-head record. Arrows remained in the ninth position with 10 points from 11 matches. Laldanmawia Ralte continued his goal-scoring spree as his strike put East Bengal on the lead in 26th minute. After a brilliant cross from Jaime Santos, Laldanmawia made a smart volley on the first time to beat Prabhsukhan Gill. He earned a penalty for his side five minutes later after being fouled by Boris Singh. But Lalrindika Ralte’s poor shot was saved by Gill. East Bengal were a man down in the second half but took the lead in 64th minute through Joby Justin after Samad Ali Mullick’s effort was saved. Manoj Mohammed clipped Asish Rai within the box and Ninthoi Meitei scored from the spot, what was a consolation goal for Arrows. Considering their form and players, Indian Arrows were relatively easy opponents for East Bengal. The side mostly comprises junior players, had to resist a team like East Bengal. However, the red and gold had to sweat it hard to get the full points. For the first five minutes, East Bengal attacked relentlessly and Toni Dovale, who made his debut for the club, went near the goalmouth couple of times. Surprisingly, they became too cautious after that and slowed down the game. There were too many passes on the midfield and no real forward movements. Joby Justin, who got the second goal, was kept quiet by Arrows defence and the Keralite wasn’t looking in his right shape. Thankfully, Laldanmawia Ralte’s goal restored some confidence. In fact, it was Danmawia and Jaime Santos who were working hard upfront as Dovale was backing them up. But still, thy were keeping the ball more on centre-line rather than pressing up high. 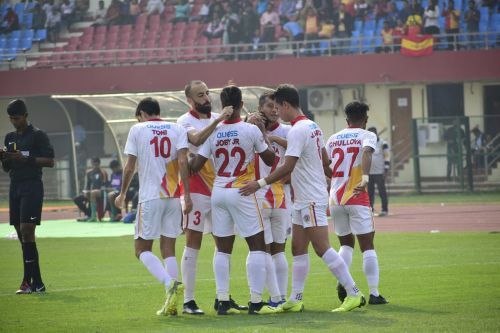 East Bengal’s approach changed in the second half and even though they were one man down for most of the time, the team opted for more attacking mindset and Justin’s timely goal proved to be the winner in the end.